‘Tis the season to stay cozy and warm! 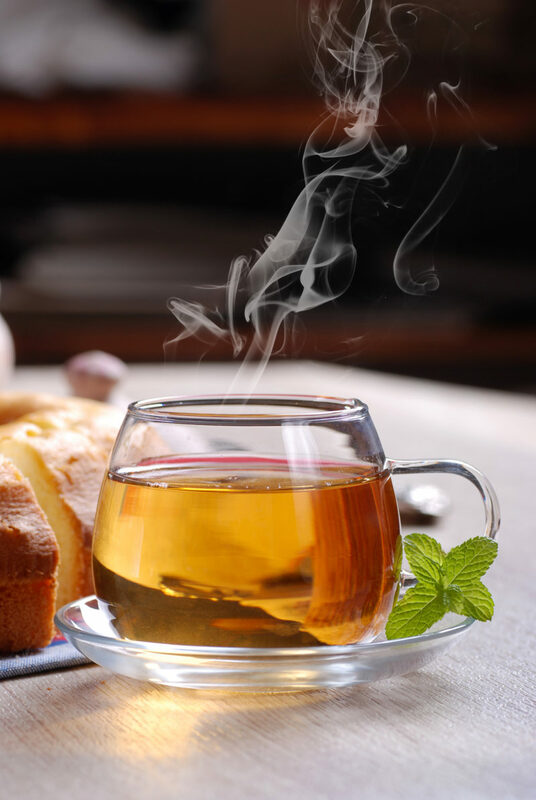 And what better way to warm up your insides than with a few piping-hot beverages? 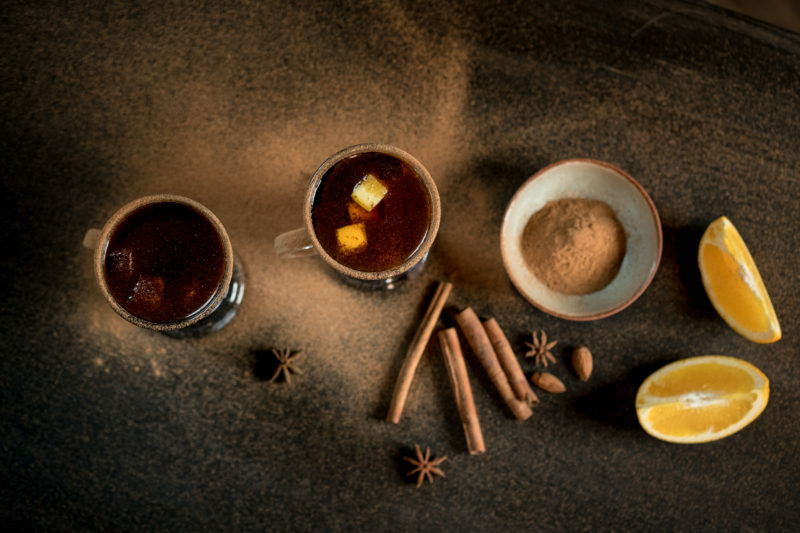 Whether you’re hosting friends and family at your home for the holidays, or you’re just wanting a single cup of comfort, here’s a roundup of some of our favorite hot holiday drinks (both alcoholic and non-alcoholic)… with a twist. 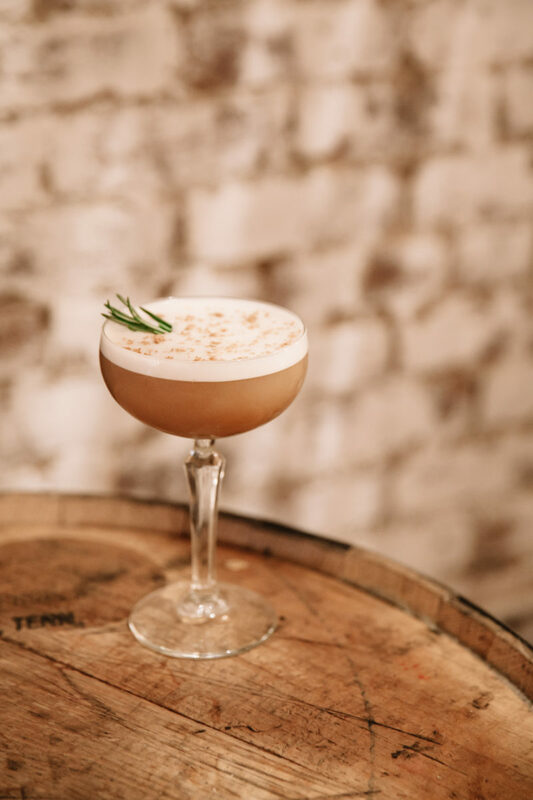 You’ve heard of a White Russian — the White Russian’s perhaps holier-than-thou cousin, the White Nun, is a heated-up version that replaces the vodka with brandy and a hot coffee-cream mixture. We feel certain that this Saveur recipe, created by San Francisco bartender Isaac Shumway, would even pass muster with the biggest White Russian connoisseur, The Big Lebowski’s The Dude. Bring ¾ ounces heavy cream, whole milk, and coffee syrup to a simmer in a 1-quart saucepan; remove from heat. Add coffee liqueur and brandy; pour into a mug. Add ¼-ounce cream to pan; whisk over medium until frothy. Pour over drink. Seeking something rich, frothy, and downright decadent? Hit all those notes with the Oatmeal Cream Pie drink, which will make you forget all about its Little Debbie cookie counterpart. This Midwest Living recipe is perfect to stick in the slow cooker. Either serve as is or mix 1 to 2 tablespoons of Irish cream liqueur into each cup. In a 3½- or 4-quart slow cooker, whisk together half-and-half, oat milk, brown sugar, and pumpkin pie spice, until sugar is dissolved. Add butter. Using a small sharp knife, split vanilla bean in half lengthwise, and scrape the seeds into the cooker; add the pod too. Cover; cook on low for 4 to 5 hours, whisking once or twice if possible. Remove vanilla bean pods; discard. Gradually whisk about 2 cups of the hot drink into egg yolks in a medium bowl. Whisk egg yolk mixture into the drink in the cooker. Serve topped with whipped cream and crumbled cookies. Hot chocolate with … tequila? Surprisingly delicious! This recipe comes from Hornitos Tequila. 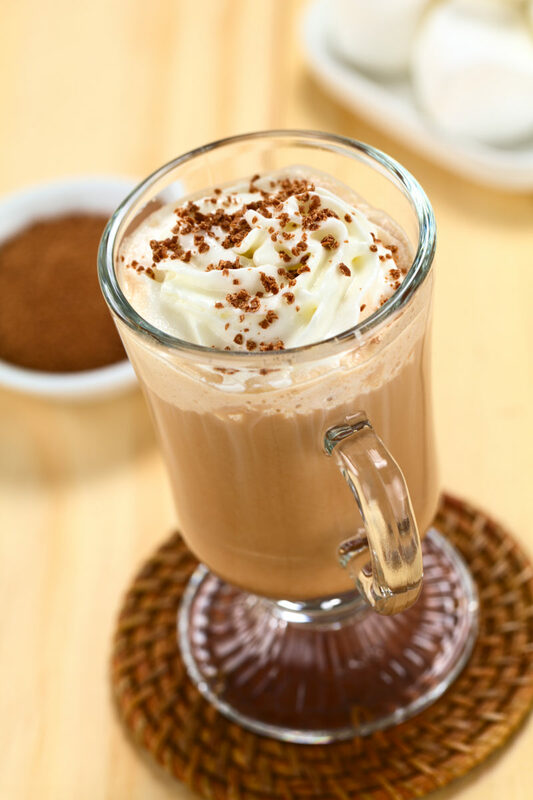 Kick it up a notch with some chili powder and whipped cream for an unexpected treat. Who says fruit punch is just for kids? This boozy drink features orange slices, lemon, pineapple, and plenty of gin — which makes for a delicious grown-up libation. Pair with cookies or finger foods for a well-rounded adult snack. Add all the ingredients to a large saucepan, and simmer over low heat for about 20 minutes. To serve, pour the hot mixture into a punch bowl or teapot, and garnish with orange slices studded with cloves. Harry Potter fans, rejoice! 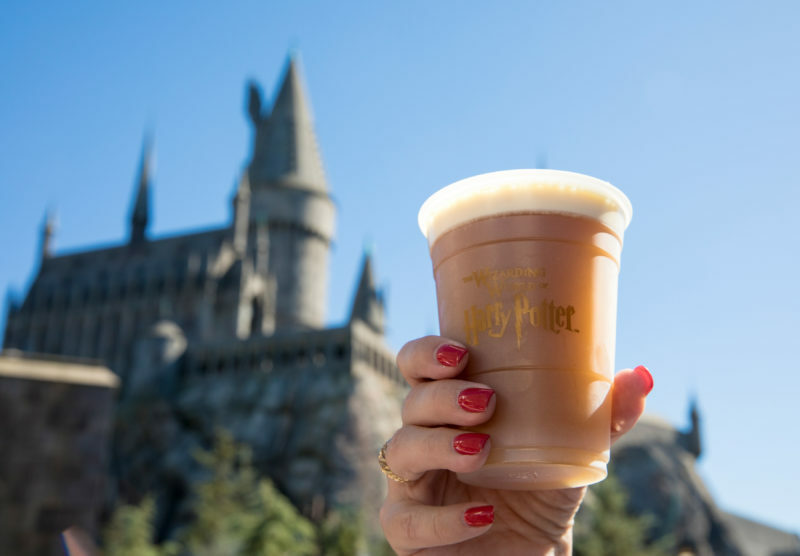 Hot butterbeer is here. And this recipe from the Tiptoe Fairy promises a sumptuous, filling treat for young and old with its blend of cream soda, butter, and milk. Combine milk, butter, and brown sugar, and whisk together. Heat in the microwave for 3 minutes. Stir and heat for an additional 3 to 4 minutes until milk is foaming. Remove from microwave and whisk together until the butter is well mixed in and sugar is completely dissolved. Heat hot butterscotch topping for 30 seconds. Then stir 2 tablespoons of hot butterscotch into the milk mixture until completely dissolved. Next add in 1 cup of cream soda and mix well. Top with Hot Butterscotch Whipped Cream. 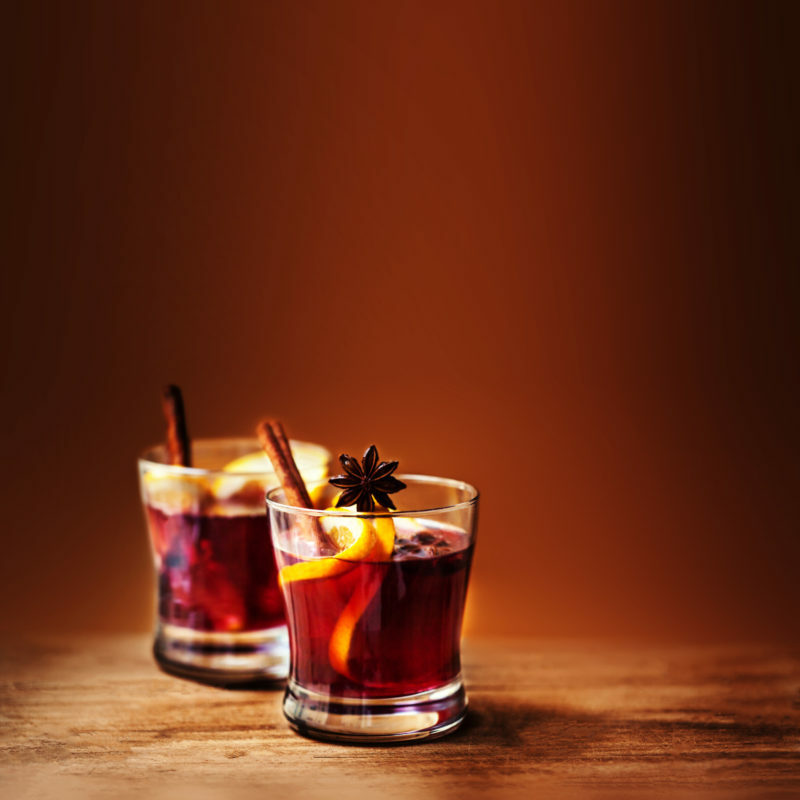 No matter what the weather brings, this cocktail, created by Gabriel Orta, of the Living Room in Miami, Florida, and published on Delish, combines winter spices, hot rum, and herbaceous rosemary for a unique taste. Add ingredients to a mixing glass; stir gently. 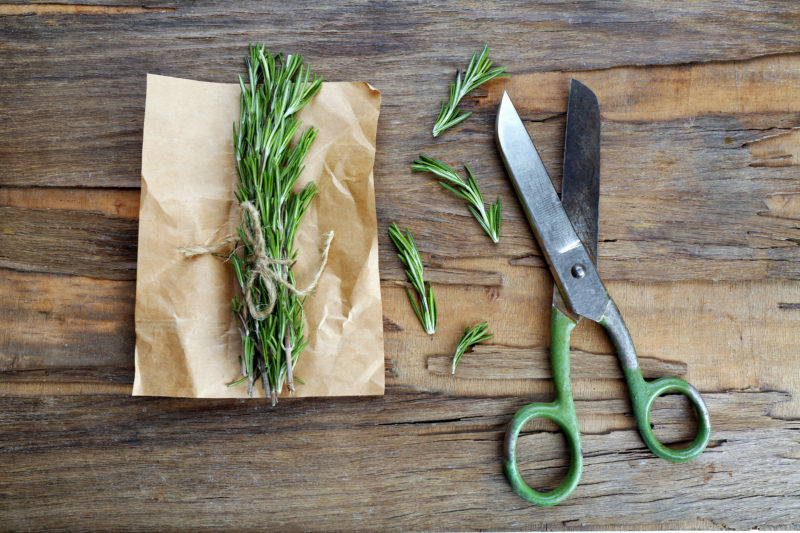 Pour all ingredients into a glass, and garnish with rosemary and star anise. Serve while hot. 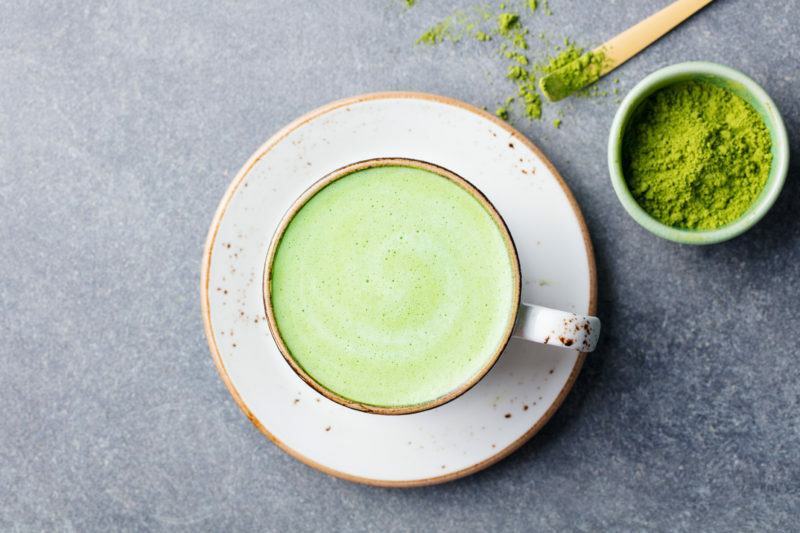 Sure peppermint is all the rage at the coffee shops right now, but why not try a fresh ginger latte that provides a crisp taste of winter? 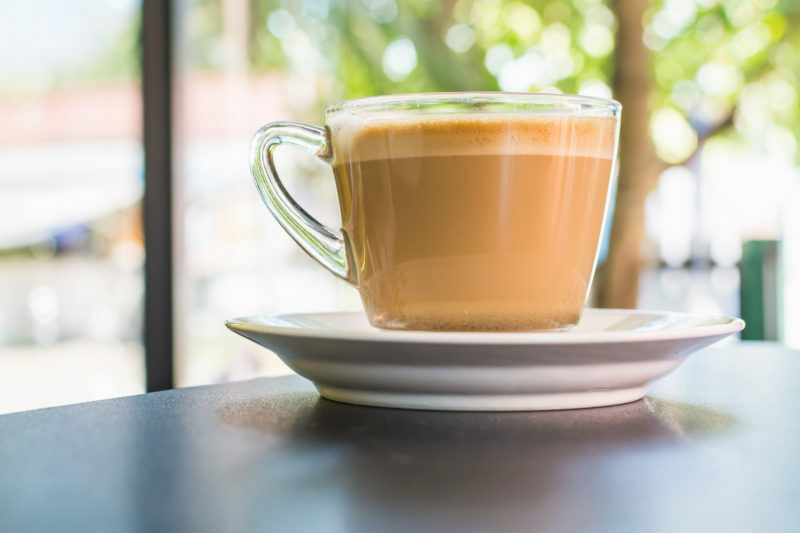 This three-ingredient latte from The Minimalist Baker blends almond milk, fresh ginger, and cane sugar for a spicy seasonal drink. 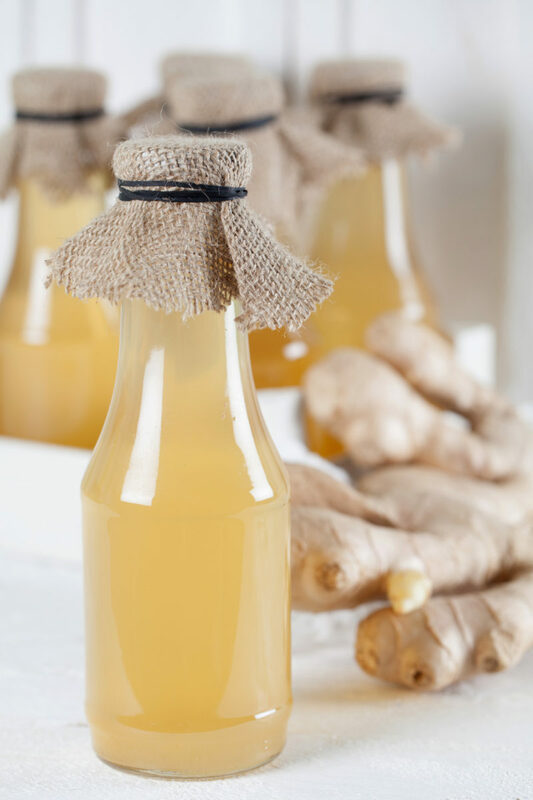 To make the ginger syrup, bring the water, sugar, and ginger to a boil, and stir to dissolve sugar. Then reduce heat to a low simmer and continue cooking for 45 minutes. Strain through a fine-mesh strainer into a bottle or jar for easy storage. 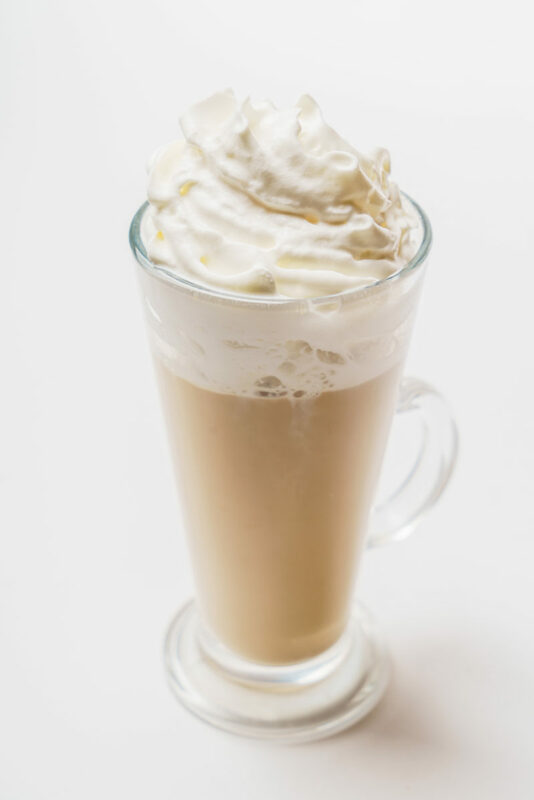 To make the ginger latte, heat almond milk in a saucepan or in a mug in the microwave. Then add 1 to 2 Tbsp ginger syrup. Taste and adjust sweetness as needed. For even more ginger flavor, first, steep a ginger tea packet in your almond milk for 3 to 5 minutes before adding syrup. Sprinkle with a little ginger powder, cinnamon or any other preferred spices, and serve. Ginger syrup should keep in the fridge for up to a month. Add a unique spin to your favorite coffee with the Indian staple, cardamom. This easy recipe from MyRecipes.com involves the simmered spice for a caffeinated winter kick. Simmer cardamom seeds and milk in a small saucepan over medium-low heat for about 5 minutes, stirring occasionally. Heat 2/3 cup water almost to boiling. Put ground coffee in a drip cone set on a large mug. Pour water over grounds. 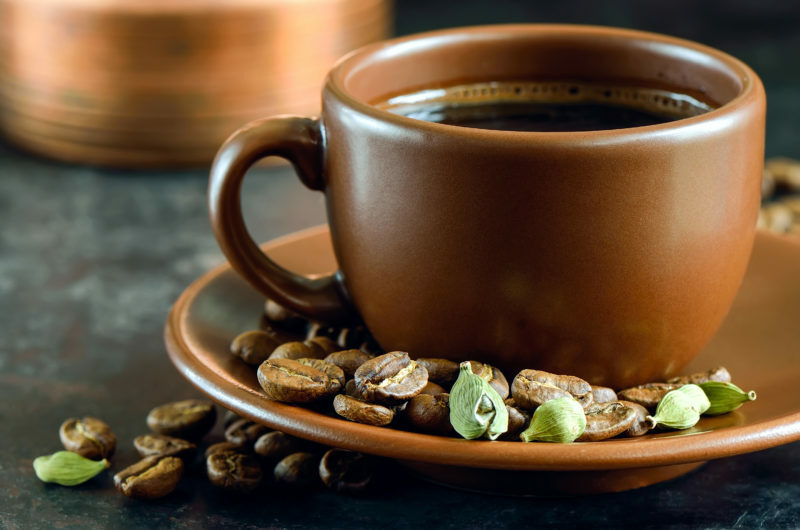 Strain milk into coffee. Stir in sugar if you like. 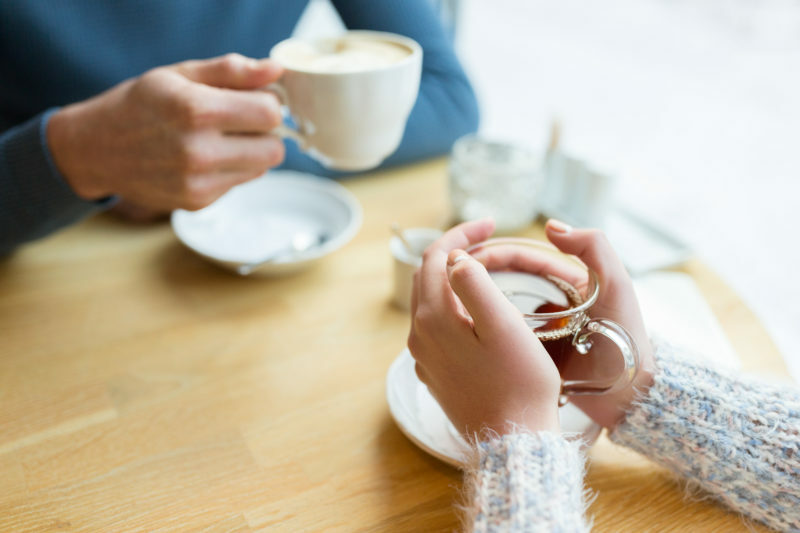 For a richer teatime experience, simply swap out the water for hot cider in your morning cup. Earl Grey tempered with sweet apple cider is especially good! Bonus: You don’t even need a recipe! We got the idea from Martha Stewart (the queen of good ideas). 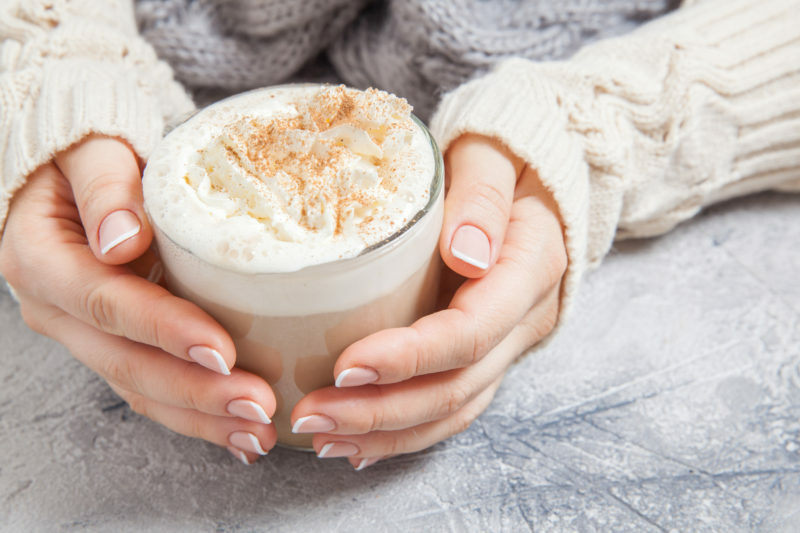 Got any warm holiday beverages that you enjoy during the season? Let us know in the comments!